Singlethread improves the customer experience at car dealerships and dramatically improves satisfaction ratings. Singlethread’s mobile-friendly web app uses text messaging to manage communication between car dealership service departments and their customers. Singlethread is a communication dashboard where car dealership Service Advisors can track and manage all of their ongoing projects, integrated with the overall dealership management system (DMS). Service Advisors text message customers and receive replies via Singlethread, which keeps the whole conversation together in one place. By clicking on URLs included in the texts they receive, customers access Singlethread via the Web to see real-time vehicle status reports. They can even pay online, which streamlines the vehicle pickup process. 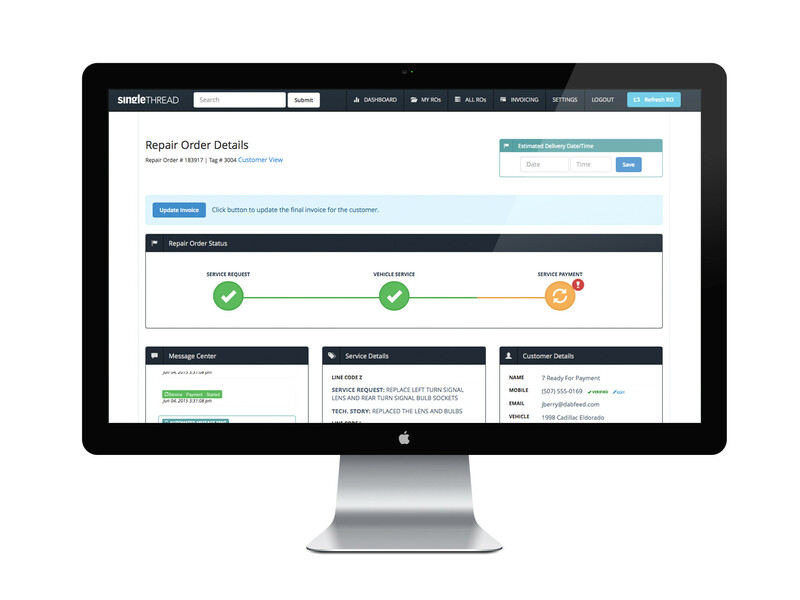 Once the service order is closed, Singlethread asks customers about their experience, allowing the dealership to address problems immediately. Significantly reduces the amount of time dealerships spend managing each customer. Gets information to customers faster and gets them back on the road sooner, increasing customer satisfaction and retention. Reduces stress and improves efficiency for service department staff, many of whom are reluctant computer users. Functions on older computers running outdated browsers, which are common in dealership service departments. Atomic provided mobile web application development for Singlethread using Rails, Angular.js, and other tools. The system integrates with dealer management systems and uses Twilio for SMS and WebSockets for push notifications.